Game description: In a dying village on Sylvarant, legend has it that a Chosen One will one day appear from among the people, and the land will be reborn. Now, you must enter a cel-shaded world in which you command real-time battles. Execute and combine hundreds of special attacks, magic spells, and combos. Each character grows to suit your fighting style, and the storyline changes based on the characters' relationships. The line between good and evil blurs in this immersive adventure where the fate of two interlocked worlds hangs in the balance. 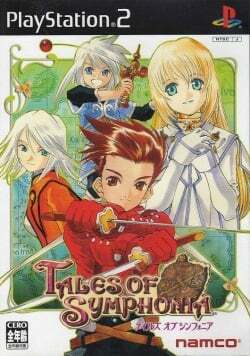 For the first time in the series, Tales of Symphonia plays in a fully three-dimensional environment. You actually are in more control over the battles than ever before thanks to the added number of strategic options you have. You can set the AI characters to behave in very specific ways, determining when and how often they use skills, how they move and how they attack enemies. This version has additional content not available in the original Gamecube release.